On Wednesday my cycle buddy and I rode our classic road route. We leave very early in the morning and aim to return before our households miss us. We meet, descend, and climb back up, every hill our locality offers, ridden companionably with our Strava (cycle app on iPhone). Wednesday was a particularly lovely day as the heavy rain that had impeded our Sunday riding schedule had stopped. The spring temperature was perfect, the views of the harbour were mesmerizing, so the slopes didn’t seem so steep. I dug deep, braced my core muscles and ascended Coronation Ave where, at the top, I was greeted by a walker. She smiled directly at me and enthusiastically exclaimed “well done” whilst giving me a thumbs up. If you know Coronation Ave you will understand that I didn’t answer. If you don’t know this street, suffice to say it is a short but intense climb. Speaking at the top is rare, even for me as a talker! They recognized us as girls! They gave the encouragement I needed to persevere up to Middle Head Road and beyond. Today is Friday and my cycle buddies and I have repeated our route but this morning there was no cheery lady at the top of Coronation Ave. There were no men walking their dogs encouraging us onward. The day was equally fine and conducive to positivity but our ride lacked the pedestrian participation of Wednesday, I missed the energy I received from their interaction with us, their positive feedback to our exertions. I am very aware carers have obstacles to overcome everyday in terms of challenges, physical, mental and economic, and at times we all need a verbal “well done.” If a carer is isolated or home bound, it is difficult to get that much needed encouragement, that little boost that just keeps you going when the day seems draining or too demanding. It is the small gestures of support that help us through our daily routines. A thumbs up or a smile can be the defining moment in a day that pivots from tedious to rewarding. I Googled ‘Smile Day’, knowing there must be such a thing.The original ‘smiley’ was created by artist Harvey Ball, he established Smile Day, which encourages people to participate in acts of kindness and friendliness, and to smile and make others smile. Smile Day was October 4th this year but we can all practice smiling for next year’s event. Why not? It’s free and enhances everyone’s well-being. I started this morning wanting to specifically address everyday carers needing an encouraging gesture in their day but this week I have seen a family breadwinner made redundant, a friend step elegantly on her path towards being cancer free, another friend bravely look stress in the face and accept a less challenging role. I reassessed and felt overwhelmed that although carers are unique as dependents rely on their constant and compassionate input, there are others that need a thumbs up and a smile too. 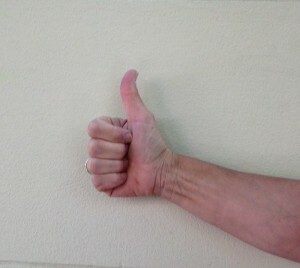 I want to promote thumbs up gestures and smiling for all. It can raise all our spirits and foster supportive interaction, which in my experience helps. I endorse positive gestures and smiling, their generous use everyday to everybody helps delineate a caring society. This entry was posted in Carers Support and tagged carers and caring, Carers Health by everydaycarer. Bookmark the permalink. I am practicing for next years ‘smile day’ right now :)…and sending you a big thumbs up too! I’ll be thinking of you next time I tackle one of my dreaded hills…not as steep as Mosman’s, but cycling up them is one of the few activities that stop me talking too! I will also be thinking hard about how I can contribute to your blog site in a practicle way that helps you achieve your goal of providing information to support other carers…apart from saying this is a fantastic idea & I think you are absolutely incredible!